accomplish. Never is running a race more rewarding, however, than when you’re running it, and challenging yourself, for a good cause. This year, Chicago’s Midway Airport gives you a chance to run a race all for a good cause as the Chicago Midway International Airport welcomes the inaugural Midway Fly Away 5K. This run is the first of its kind, and the first ever race to take place at Chicago’s Midway Airport on the airfield. Proceeds from the Midway Fly Away 5K will go toward Special Olympics Chicago. The 2013 Midway Fly Away 5K will take place on September 15th at the Chicago Midway International Airport inside the Southwest Airline’s hangar. Runners participating in the first every run to benefit Special Olympics Chicago will be treated to a unique experience as their 5K run will take them through Midway Airport’s airfield. Throughout the run, it will be business as usual at Chicago busy airport. 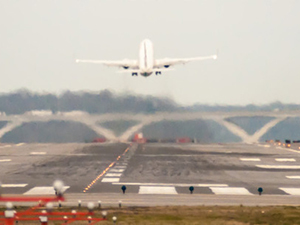 This means, as a runner, you will see close-ups of airplanes taking off and landing. You will also get a behind-the-scenes look at the inner workings of an airport. Entry for the airport’s 5K run is $35 and includes an official event t-shirt. All participants over the age of 18 will be entered into a draw to win two round trip tickets from Southwest Airlines to fly anywhere in the continental United States. In order to be allowed to participate in the airport’s first ever run, participants will be required to bring valid government-issued I.D. Upon arriving at the Southwest Airlines hangar, race participants will be given their racing bib and a raffle ticket. In order to be entered into the draw for two round-trip airline tickets, participants must drop their raffle ticket into the bin at the end of the race. The first ever Midway Fly Away 5K is destined to be a fun, exciting, and challenging event which benefits a great cause. There will be some exciting photo opportunities as planes take off and land all around the racecourse, so be sure to bring your camera. In order to take part in the Midway Fly Away 5K, be sure to register prior to September 10th, 2013. To register for the Midway Fly Away 5K, click here. In addition to the Best Western Midway’s convenient location, we also provide our guests with a number of luxurious amenities at an affordable price. While staying with us, our guests enjoy free parking, complimentary breakfasts, access to our exercise room as well as access to both our indoor pool and whirlpool. Thanks to our hotel’s amazing location, excellent amenities, and affordable price, the Best Western Midway Chicago Hotel is the best place to stay when visiting Chicago for the first ever Midway Fly Away 5K. Book your stay at our website or contact us directly by calling 1-877-891-7666.